For Jewish and pro-Israel sports fans Coach David Blatt of the Cleveland Cavaliers was a bit of a novelty. Sure, there have been Jewish coaches in the National Basketball Association (NBA) in the past -- the legendary Red Auerbach, Red Holzman and Larry Brown to name a few. But David Blatt was the first Israeli head coach in the NBA and to Jewish basketball fans that was a source of pride. On Friday, David Blatt became the first coach to be fired when his team had the best record in a conference since conference play started in the NBA back in 1970-71. That's not something Jewish basketball fans will be proud of. In fact, it's a statistic that has left people scratching their heads. 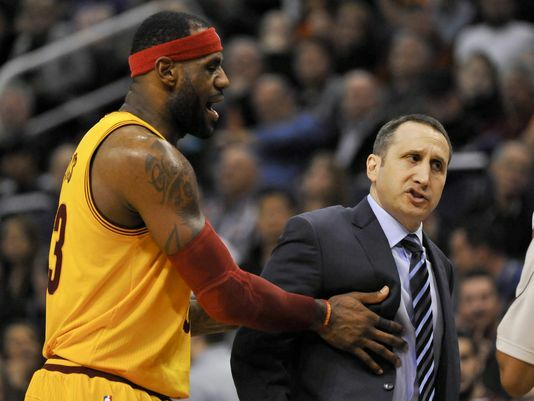 Cavs owner Dan Gilbert, himself Jewish and a supporter of Israel, fired Coach Blatt late last week. No one questioned that Blatt's termination was motivated by his Israeli connection. Many, in fact, speculated that LeBron James wanted Tyronn Lue, an assistant coach, to lead the team. Regardless of the rationale for terminating Blatt, there's no question that the timing was odd. At the time of his firing, the Cavs were in first place with a .732 winning percentage and there were still a few weeks to go until the All Star break. Many in the league (including Tyronn Lue, the new head coach of the Cavs) are insisting that Blatt still be allowed to coach the East team in the All Star Game in mid-February. Blatt’s sophomore season as Cleveland's head coach (he had only coached in Israel and Europe previously) was going even better than his first year when the Cavs made it to the NBA Finals. While no one suggests that the decision to fire Blatt was at all related to his Israeli background (he was born in the U.S., but has called Israel home since making aliyah in 1981), there was a lot of anti-Israel and anti-Semitic rhetoric in the comment sections of the stories in the press that broke Friday after the news of his termination. Commenting on Blatt's firing, Detroit Pistons head coach Stan Van Gundy ranted, "It’s embarrassing for the league... we all get into this no matter what happens. You’re supposed to win. He did. He did, and now he’s still getting fired... That one – to me – elevated all of the coach firings totally into the theater of the absurd... I don’t know if anybody knows what the expectations of coaches are anymore." USA Today ran a story right after Blatt's firing about the response in Israel. The opening line of the article was, "The Cleveland Cavaliers suddenly have far fewer fans in Israel after the firing of David Blatt." It said that news of the firing topped all Israeli newscasts Saturday, knocking Middle East violence off the headlines. One Israeli lamented, "Finally I can go back to hating LeBron without feeling guilty. Hope he never sees a title in his life." Israelis rallied around Cleveland for one reason: their beloved Coach Blatt. Now, those same fans are left questioning why he was fired. On a personal note, I met Coach David Blatt following a Cavaliers-Pistons game one year ago and found him to be extremely friendly and kind. He took the time to talk to my son in Hebrew, wish him a happy birthday and then offered a "Shabbat Shalom" greeting together with my son, Josh, and the friends he brought to the game. I for one will miss having David Blatt in the NBA and hope that another team will soon hire him as a head coach. He's got a smart basketball IQ and deserves to have another shot at coaching in the NBA.